Samsung has seemingly outdone itself with the Samsung Galaxy S6 - never before has a Galaxy had such a premium feel. Without a shadow of a doubt, it's miles ahead of the former flagship in terms of design. Gone is the "glam" design of the Galaxy S5 (whew! ), welcome the metal and glass finish of the new flagship, which will undoubtedly attract more fuzz. In the meantime, the Samsung Galaxy Note 4 was certainly a step forward in terms of design. "What are you talking about, PhoneArena, this is a specs comparison! ", you'd certainly argue. Indeed, you are most right! We wanted to stress on the differences between the design, which gradually continue to the specs sheets of the Galaxies. A Samsung high-end device has never before been under-powered. On the contrary, they have always been on the very edge of the hardware front, crushing a large number of its rivals at the time. 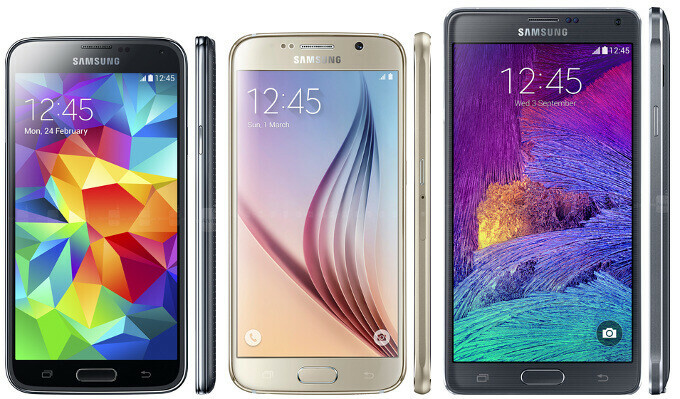 Here's how the Galaxy S6, the Galaxy S5, and the Galaxy Note 4 fare specs-wise. Of course you would think that if you're a troll. But if you aren't, the generic spec sheet is a letdown because it doesn't go into specificity the engineering and quality that went into making these components, and they aren't the same as last year's hardware, just represented by a number. There's various functionality increases over the S5 and Note 4. What functionality increases are there? A better cpu and slightly better camera? There is nothing about the build of it that increases functionality.. It just makes it look better, while taking away features that most people praised it for. Looks great except for no SD card and smaller batterty. Everything else looks good, Design is much better than S5. I agree with the first comment. Big let down. And no Im not a troll... I'm a Samsung Galaxy user since the S2. Why make the battery smaller if it's not going to be removable? Why remove an SD card slot? I'll tell you exactly why! To make more money! The smaller battery will increase charging which makes the battery die faster. No SD slot means they can over charge for internal storage (just like Apple). Who would trade very useful features just for the device to look better? Not anyone in their right mind.. They should've just continued with the Alpha and Note 4 build, metal and plastic, and kept all their signature features. Now it's just more similar to the iPhone.. I don't like that.